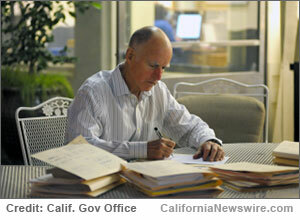 SACRAMENTO, Calif. /California Newswire/ — On Tues., Calif. Governor Edmund G. Brown Jr. announced the following appointments: First, Amy Costa, 39, of Alameda, has been appointed chief deputy director for budget at the California Department of Finance, where she has served as advisor to the director on higher education since 2014. She was an account lead at Blue Beyond Consulting from 2012 to 2014, director of state and local government relations at Safeway Inc. from 2010 to 2012 and associate director of advocacy and state relations at the California State University Chancellor’s Office from 2009 to 2010. She served as policy director in the Office of California State Senator Dean Florez from 2008 to 2009, a policy consultant in the Office of California State Senate President pro Tempore Don Perata from 2005 to 2008 and district director in the Office of California State Senator Don Perata from 2000 to 2003. This position does not require Senate confirmation and the compensation is $169,284. Costa is a Democrat. Gina McKinzey, 49, of Chalfant Valley, has been appointed to the 18th District Agricultural Association, Eastern Sierra Tri-County Fair Board of Directors. McKinzey has been an administrative analyst at Inyo County Health and Human Services since 2014. She served as a staff service analyst at Inyo County Child Support Services from 2012 to 2014, an account technician at Inyo County Public Health Department from 2011 to 2012 and was a bookkeeper at Benefit Management Inc. from 2006 to 2010. McKinzey is treasurer at the Bishop Little League Board. This position does not require Senate confirmation and is no compensation. McKinzey is a Democrat.